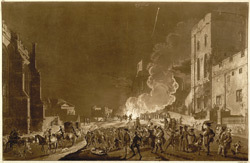 View of the festivities in the lower court of Windsor Castle during Guy Fawkes Night, showing the gathering near the bonfire and fireworks in the sky. The lower court did not hold many stately lodgings or rooms of state but did have the impressive Chapel of the Order of the Garter. The artist is influential English watercolorist Paul Sandby. His brother Thomas Sandby was Deputy Ranger of the Royal Park at Windsor, and the two brothers lived there. During the 1770s, Paul Sandby produced many views of the castle and its environs. This is one of a group of four prints of Windsor Castle published in September 1776.